Apologies for the slightly dodgy photos, I'm just squeezing this post in for the 'Classic French' challenge at Blue Kitchen Bakes which closes tomorrow. The theme for January is 'souffle'. I've been meaning to get my souffle baked since early in January but somehow it just didn't happen. I also had a tub of Food Thoughts Cocoa sent to me for review so I thought I'd try it out with a Chocolate Souffle. 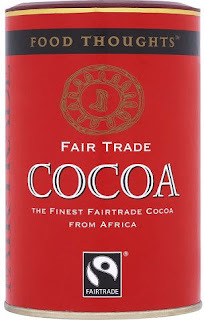 "Food Thoughts Cocoa is a luxurious baking and drinking cocoa, made with the finest cocoa beans. It is rich and smooth in texture and has a deep rounded flavour preferred by bakers for it's high cocoa fat content. 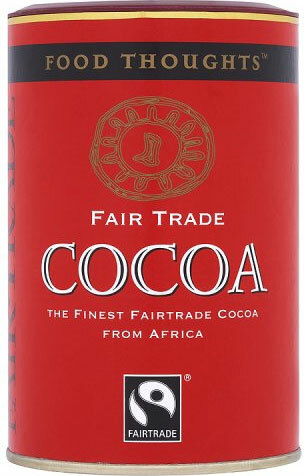 Food Thoughts Cocoa is 100% Fairtrade Organic Cocoa is produced in the Dominican Republic by an accredited Faritrade consortium." Butter or coat the ramekins, sprinkle with 3/4 tsp caster sugar. Combine 2 tbsp caster sugar, flour, cocoa and milk in a small saucepan over medium heat. Cook 2 minutes, stirring until smooth. Spoon chocolate mixture into a medium bowl; cool 4 minutes, stir in vanilla and the egg yolk. Place egg white in a medium bowl; beat with a mixer at high speed until soft peaks form. Add remaining 2 tbsp caster sugar, 1 tsp at a time, beating until stiff peaks form (do not overbeat). 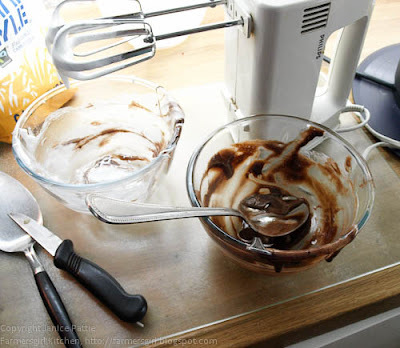 Gently stir 1/4 of egg white mixture into chocolate mixture; gently fold in remaining egg white mixture. Spoon into prepared dishes. Sharply tap dishes 2 or 3 times to level. Place dishes on baking sheet; bake at 180C for 15 minutes or until puffy and set. 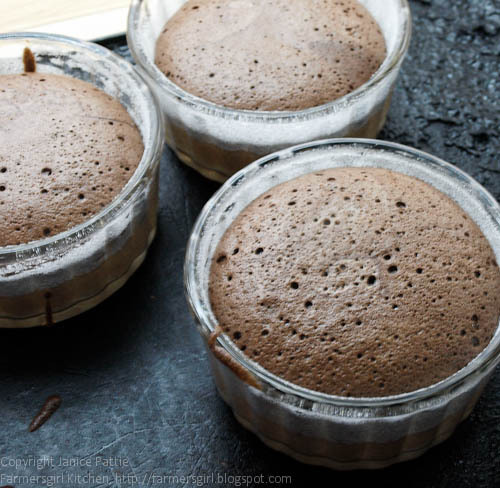 Sprinkle each souffle with 1/2 tsp icing sugar. Serve immediately. The eagle-eyed amongst you will see that I didn't sprinkle mine with icing sugar. I simply didn't have time and didn't want the souffles to fall before they arrived at the table. We really enjoyed the souffle, it tasted as if it had been made with chocolate rather than cocoa, there was no bitterness that you get with some cocoa powders. The souffle wasn't difficult to make and turned out very well. I was supplied with one tub of Food Thoughts Cocoa and was not paid to write a positive review, all opinions are my own. They are really not difficult Rachel. I've made sweet souffles before but this is the easiest recipe yet. Those soufflés look gorgeous Janice and if you hadn't mentioned the icing sugar I doubt anyone would have known. Great minds and all that - I've just posted my cocoa review. Thanks for snakeing these into the challenge, they look great! I made my first ever souffles this month and chocolate ones are on my wish list for the near future! Glad to hear the cocoa powder baked well, I've not cooked anything with mine yet.